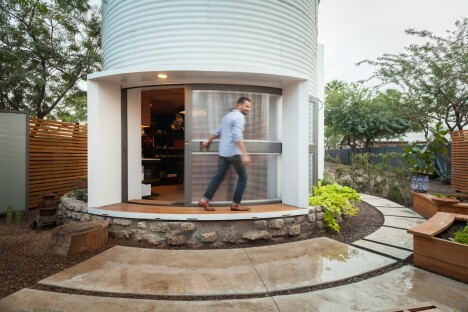 With an entirely custom-built interior, a nine-foot-wide sliding glass door and a warm modern aesthetic, this grain silo converted to a compact home seems worlds away from its humble farmyard origins. 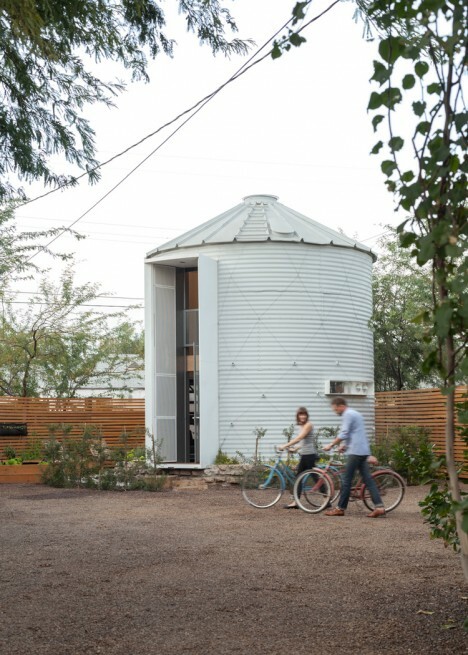 Architect Christoph Kaiser purchased the 1955 corrugated steel wall silo from a Kansas farmer and had it dismantled and shipped to downtown Phoenix, Arizona on the back of a pickup truck to begin the renovation process that would transform it into a beautiful, cozy and affordable two-story residence. 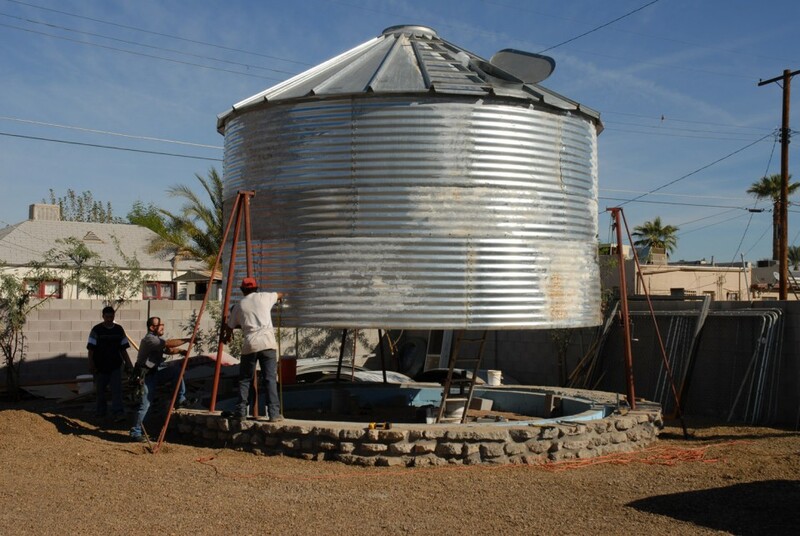 Once set in place in the up-and-coming Garfield Historic District, the silo began its dramatic makeover process. 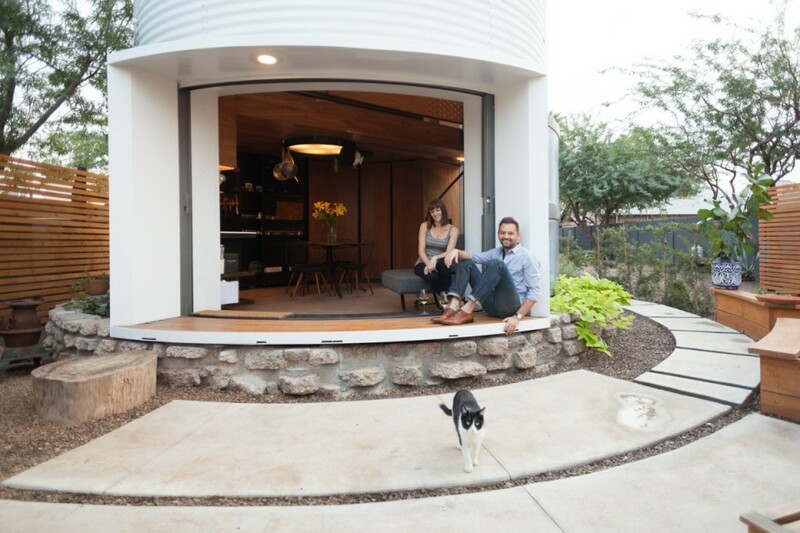 Large doors and windows were added to bring light into the previously darkened space, and the oculus at the top used to promote air circulation to the stored grain was turned into a skylight. 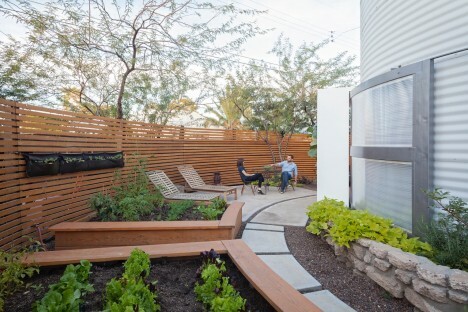 Views of the Phoenix skyline are strategically framed, with the other windows looking out onto a spacious private garden. 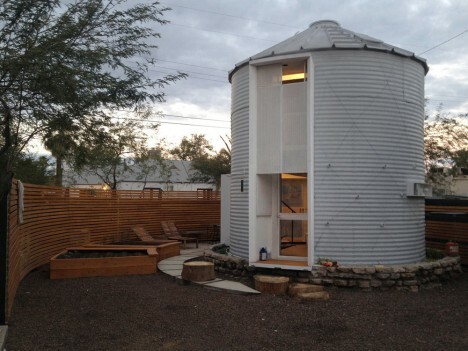 With the silo’s tiny footprint, maximizing the interior space was a top priority. 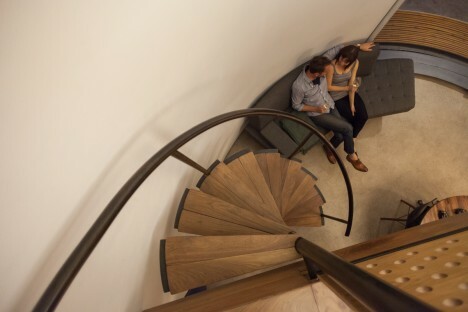 Kaiser designed a built-in, all-in-one solution that’s essentially one big piece of furniture to accommodate all of the residents’ daily living needs. 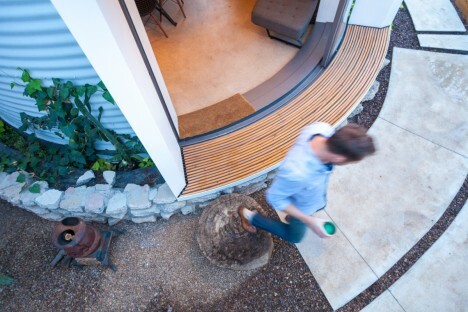 Curved to match the line of the walls, the custom interior is clad mostly in reclaimed walnut flooring scored on Craigslist. 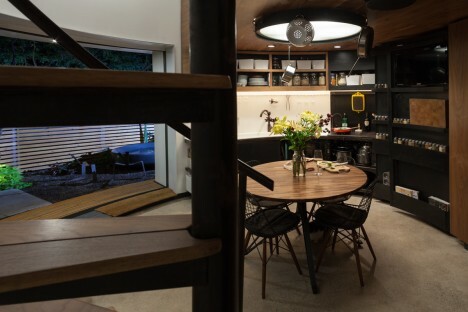 Kaiser even designed a one-of-a-kind ceiling lamp with hooks for hanging pots and pans to save space. 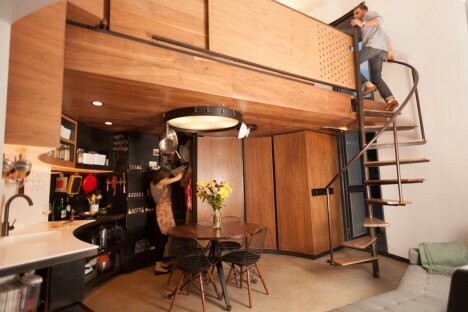 The Eames wire chairs are the only elements that weren’t custom-made for the home. 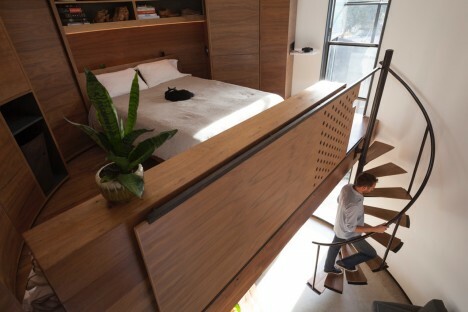 A spiraling staircase leads to the sleeping loft, which is equipped with a digital projector so the couple has their very own mini movie theater in their bedroom. 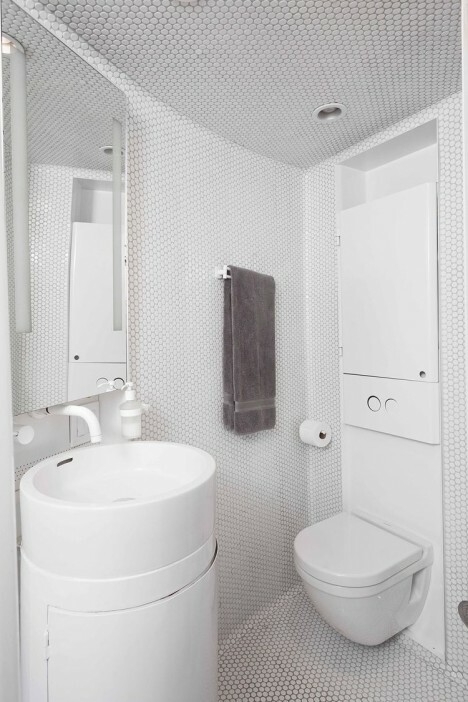 The bathroom, finished in glossy floor-to-ceiling penny tile, boasts a rounded custom vanity and compact Duravit toilet. 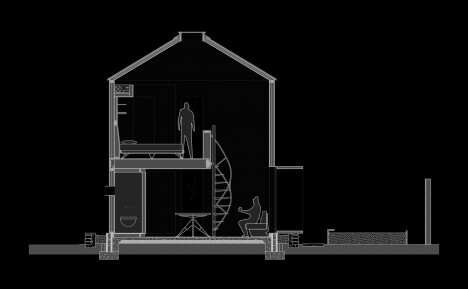 When the nine-foot window is opened to the garden in nice weather, the home seems to expand.